There is an unquestionable elegance associated with designer ethnic wear. Born out of our ancient heritage and age-old traditions, we bring to you a spectacle of elegant indo western designer dresses options. 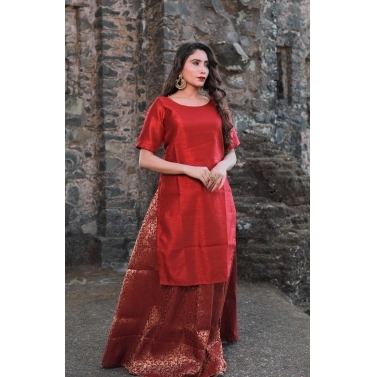 Whether you are stocking up for a festive soiree, extravagant wedding or a family function, or are looking for chic everyday indo western design, you are at the right place to shop designer indo western dresses for womens. 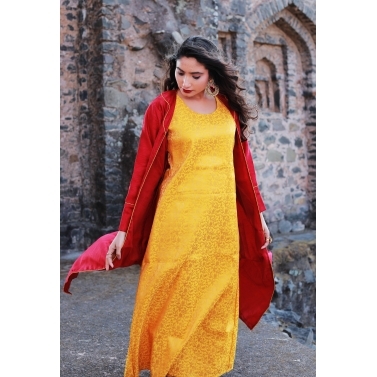 Our designer ethnic wear collection exhibits an array of kurtis, kurta sets, sarees, gowns, lehengas, dresses, tops, anarkalis, dupattas, capes and much more. Shop your pick of indo western designer dresses and make the heads turn. Not long ago, indo western designer dresses took a backseat in the global fashion industry, and there were countable reasons for the same. Then instantaneously, indo western design began to make a re-appearance; and today, dressing up the ethnicway is not so boring anymore. We bring you so many talented designers who have designed such elegant designer ethnic wear that it kind of gets extremely difficult to pick just one. At the moment, every single woman waits for an opportunity to wear designer ethnic dresses and never lets go of one. Now, do we know the staples of designer ethnic wear for women? Not to worry, we are just about to talk on that. Whatever it is that may define you – we need designer sarees in our ethnic closet because nothing is more captivating on a lady than a designer saree. Designer sarees are considered to be the pride of India and its age old heritage. Today, designer sarees have been given a makeover and are available in many indo western designs. From saree gowns to shirt sarees, embellished to florals, GetNatty has all the varieties needed to enthral your heart. It is as important in an ethnic closet as rice is to Indian food. As the name defines, a designer kurta set includes a kurta, bottoms and dupatta. Over the years, kurta sets have taken many forms in terms of designs and patterns. GetNatty boasts a wide variety of kurta sets. There are multiple options in various fabrics, silhouettes, pattern, embroidery and embellishments. Indo western designer dresses are every fashionista’s favourite piece of the moment. With unique silhouettes and cuts, indo western design are a must-have. There was a time when innovation went for freeze in designer ethnic dresses and the credit for the same goes to Anarkali. They have practically ruled the throne in the category of designer indo western dresses for women. But all said and done, honestly no one can ever get enough of anarkalis in their closet. At GetNatty, we have a wide range to anarkalis to satisfy your search for head-turning indo western designs. Anarkalis are long, voluminous and floor-length with A-line cuts. They are available in various fabrics on GetNatty like tulle, silk, cotton and more.They will always have a considerable market share and no one can deny that. Lehenga Choli are the most favourite and sought after bridal wear. In India, women from most of the communities get married wearing lehenga choli and today, the designs of lehenga choli are overwhelming. From lace to zari, tulle to silk, embroidery to embellishment, there are unparallel options available on GetNatty. Soon-to-be brides or bridesmaid, we have a perfect outfit for all.